A little Krispy Kreme history brings some sweet treats your way! If you like the taste of Krispy Kreme doughnuts, you may be able to get some for FREE just for taking a moment to read and answer a trivia question. Anyone in the U.S. who has a Krispy Kreme store in their area can win. 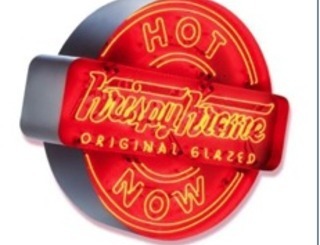 The Krispy Kreme Corporation is conecting socially with its customers in a whole new way. In fact, the company just released an app. What does the app offer? Here’s a link to help you find the answer. Look for the ‘Leave Comment’ link at the very bottom of this article to submit your answer for your opportunity to win a Krispy Kreme gift pack! Customers can download or bookmark for directions to any store in the U.S. or to receive alerts when a “Hot Now” sign is on. Sweet answer and correct. I actually tried out the app and was able to know that 6pm was the time my Krispy Kreme turned on the light to let folks know they had those melt-in-your-mouth doughnuts. Amazing to realize that Krispy Kreme is available in 21 countries today.